More Blogs About Technology and Food: Next Ubuntu version will be named "Maverick Meerkat"
Next Ubuntu version will be named "Maverick Meerkat"
Looks like things are really heating up in the Ubuntu camp. Mark Shuttleworth, former CEO of Canonical, has just recently announced that the next version of Ubuntu (version 10.10) will be named "Maverick Meerkat". The currently upcoming version, 10.04, is named "Lucid Lynx". Lucid Lynx, due by the end of this month, is shaping up to be a major transition for Ubuntu, and Linux in general. 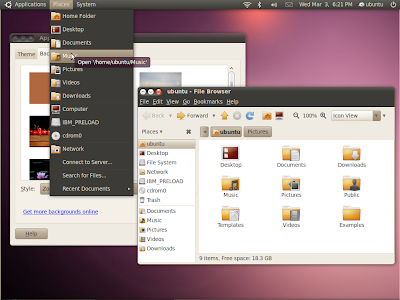 Its biggest change is its new "Light" theme, which does away with the familiar browns and earth tones of previous versions of the default GNOME theme, and instead offers a theme composed of purples and blacks, a slightly more Mac OS X-like layout, and a cleaner GNOME desktop (image below taken from the Ubuntu wiki). Having played around with the beta of Lucid Lynx, getting a feel for its new features, software, and support for hardware (nVidia graphics chips have far, far better support, and the new nouveau driver makes it much easier to support such chips; netbook support is much improved), I can easily say that Ubuntu's going to bring me back to wanting to use it as my desktop Linux distro easily. I usually recommend Ubuntu as the Linux distro for newcomers, but I believe that even hardened Linux vets may want to give Ubuntu another look now. The new Ubuntu Software Center (from Ubuntu 9.10) will make installing apps for beginners a breeze; I've even had a few people ask why Windows doesn't have anything like that... even Mac OS X has a similar idea in the form of Bodega, a 1-click app installer utility! Maverick Meerkat looks to be taking everything Lucid Lynx is doing, and kicking it into massive overdrive. Canonical's goal is to get Ubuntu and free software onto every desktop PC they can from every major manufacturer, a bold move indeed. Some manufacturers like Dell and System76 already offer Ubuntu preinstalled on laptops, but it's only System76 that displays those laptops prominently; Dell still has to tuck them off to the side due to Microsoft's strongarm tactics of threatening computer manufacturers with revoking licenses for Windows or taxing computers sold without Windows or an alternative OS. The new Ubuntu version looks to give Microsoft a powerful kick in the testicles. I'm seriously considering giving lessons to people interested in switching to Ubuntu from another OS. Perhaps a couple of days a month at one of the Brooklyn libraries (either Grand Army Plaza or Carroll Gardens, as I know how to get to both of those easily). Keep watch on my Twitter account for announcements. I leave you dear readers with one final link... read Mark Shuttleworth's blog post about Maverick Meerkat and its direction here.